Perhaps nobody in major league history has had a first week as a manager like Gabe Kapler. In less than a half a week on the job as manager of the Phillies, Kapler pulled his ace during a shutout performance despite having only throw 66 pitches; he called in a player to pitch who wasn’t warmed up; and his defensive post game interviews created the impression that the former 13 year veteran was simply not cut out to manage in the big leagues. Since these blunders occurred on Opening Day when everyone is watching, it was only natural that the media spent upwards of a week insulting his competency. Even some of Kapler’s own players, notably Nick Williams, said that his over-analytical approach felt borderline dehumanizing. When Williams was asked about Kapler’s tendency to prioritize statistics in his cookie-cutter decision-making style, the Phillies outfielder held nothing back. “I guess the computers are making it, I don’t know. I don’t get any of it, what can I do”. Williams’ frustration came through clearly. The implication is that rather than viewing his players as people, he pencils out the lineup card and makes in-game substitutions each day by blindly following whatever his front office issued stat sheet tells him to do. This narrative circulated on every talk show and sports column for the better half of the first two weeks, with some writers going so far as to say that Kapler’s job was already in jeopardy. Fast Forward two weeks and the Phillies stand at 11-7, winning in 8 of their last ten games. As the Phillies put together some wins, the scrutiny of Kapler naturally eased, a sequence of events that is not out of the ordinary when national writers speculate for the purposes of creating an unsubstantiated narrative. While advanced analytics, and those who abide them, were public enemy number one for Philly fans during the first week of the season (and for good reason considering the questionable data-driven moves Kapler made during the first week), the Philly faithful should not neglect sabermetrics altogether because of a few bad first impressions. The Phillies certainly have a better roster than they did a season ago. But their offensive resurgence probably has more to do with their adoption of analytical tools than it does with their new additions. Through the first 18 games of the season, the Phillies offense has been a microcosm of the modern hitting approach by combining patience at the plate with a large percentage of fly balls. First, let’s address the Phillies new patient approach. As a team, they lead MLB in pitches per plate appearance with 4.22 pitches seen per at-bat. Of course, there are pros and cons to an overly patient approach. On the one hand, their collective ability to work the count is a huge reason why they lead the league with a 12.5% walk rate. On the other hand, seeing more pitches means getting into more two-strike counts, which is a large reason why the club currently has the 8th highest strikeout rate in all of baseball. How the increase in both walks and strikeouts translates into runs is yet to be seen, but I am willing to bet that putting a few extra runners on base each game will outweigh their greater tendency to whiff. The second most alarming change to the Phillie’s offensive profile is their attempt to lift the ball more. At this point in the ongoing flyball revolution, the merits of such an approach are well-established. Flyballs have a markedly better OPS than ground balls, plus fly balls make you immune to the double play. Not to mention that Citizens Bank Park (which is where the Phillies call home) had a home run park factor of 1.409 last season, which ranked first in baseball, outpacing hitter’s havens like Yankee Stadium and Coors Field. (A park factor of 1.409 means that home runs are hit with 41% more frequency at Citizen Banks Park compared to the league average park). To illustrate just how drastic the Phillie’s pivot towards fly balls has been from last year to now, take a look at the team’s flyball rates over the last five seasons. If you are more of the cutting edge Statcast type, this same idea can be expressed through average launch angle as well. The Phillies play in one of the most hitter-friendly ballparks in the MLB, so the fact that for the last four years their team FB% was lower than league average tells me that they were not fully capitalizing on their home field advantage. Furthermore, I added the league average FB% on the right side of this table to show that contrary to popular belief, the frequency of fly balls league-wide has not increased as much as some people may think given the often cited “flyball revolution” that we are believed to be in the middle of. Now I understand that we are still about ten days away from the May so I am very cognizant of small sample size considerations. With that said, batted ball tendencies tend to normalize fairly quickly. This sample is also the aggregate of all Phillies hitters, which makes this early trend more indicative of a philosophical change that should persist as opposed to being written off a just an early season coincidence. A Change in Personnel or Philosophy? One factor worth considering in attempting to explain this dramatic increase in fly balls is simply a change in personnel from years prior. A year ago, the club was without Rhys Hoskins, Carlos Santana, Scott Kingery, and Jorge Alfaro, so it is quite possible that these additions could account for the uptick in fly balls. As of today, April 20th, Carlos Santana and Rhys Hoskins lead the Phillies with FB% of 52.6% and 51.9% percent respectively, with Scott Kingery also putting over 42% of his batted balls in the air. Aside from Santana, however, these other two young players have been groomed by Phillies hitting coaches throughout their entire careers and are both posting career-highs in flyball rate (minors stats included). While both Kingery and Hoskins elevate their batted balls at a rate above league average, their biggest year-to-year jump has taken place this season, which indicates to me that this team-wide increase is evidence of a change in philosophy rather than a result of roster reconstruction. This theory gains more validity when we compare the year-to-year flyball rates for some of the Phillies players that have been with the club for multiple seasons. For example, Aaron Altherr, who is entering his third season with the Phils, has boosted his FB% from a career average of 34.5% to 48.0% this season. Maikel Franco’s sudden uptick in fly balls is similar to Altherr as the power-hitting third baseman has raised his FB% from a career rate of 36.3% to 46.5% in 2018. Even players whose best offensive tool is not their power such as Odubel Herrera and Cesar Hernandez have boosted their FB% by 3% apiece. I have talked a lot about the team’s newfound affinity for the flyball, but these last 1000 words have been useless if this approach isn’t actually translating into tangible results. Luckily, for me, and for the Phillies, there is every indication that this approach has helped to improve a Phillies offense that ranked 27th in the MLB in runs just a season ago. This season they rank 7th in runs, 2nd in walks, and 3rd in xwOBA, all indications that every hitter one through nine should be filling up the stat sheet. When you subtract the club’s actual wOBA from its xWOBA, Philadelphia has the largest discrepancy in the league, meaning that despite making a better quality of contact than all but two other teams, their well-hit balls are somehow ending up in gloves. The Phillies may have also picked a bad month to adopt a new flyball heavy approach. With frigid conditions sweeping the nation, the ball is not flying as far as evidenced by declining home run totals relative to last season. Luckily for the Phillies, summer is just around the corner so once the temperature starts heating up we may see a barrage of home runs by Philly hitters who can finally put their offseason swing adjustments to good use. Lastly, the Phillies have played just seven of their 18 games at their home ballpark. Making an adjustment to take advantage of the hitter-friendly dimensions of your home ballpark isn’t very helpful when you are deprived of the chance of playing there. Despite playing under 40% of their games at home, we can take all the batted balls that Phillies’ batters hit on the road and overlay Citizens Bank Park to determine if these balls would have been home runs had the Phillies been at home. After analyzing each fly ball from Phillies hitters on the road, I found eleven different occurrences in which had that identical ball been hit at home, it would have been a home run. Here is the player-by-player breakdown of the guys that were robbed by less favorable hitting environments. As it currently stands, the Phillies have just the 20th most long balls in the MLB this season. However, when we take into account the additional 14 home runs that would have been homers had they not been hit on the road in pitcher-friendly ballparks, it would be the Phillies at the top of the home run leaderboard. With the signing of Carlos Santana, a full season of Rhys Hoskins, a rejuvenated Maikel Franco, and the human spark plug that is Scott Kingery, the Phillies have the potential to be a force to be reckoned with this year in the NL East. 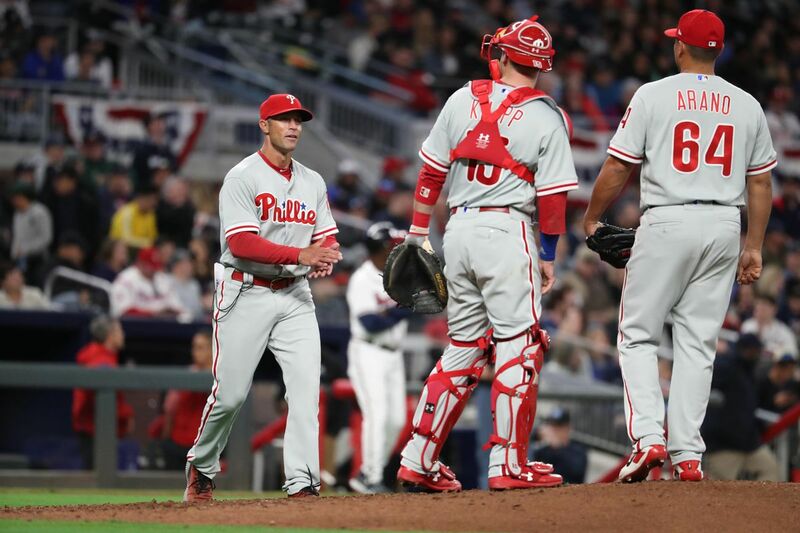 While Gabe Kapler’s image as a robotic stathead gave Phillies fans outrage in the early going, I think it is imperative to acknowledge the things he does do right this season, rather than succumbing to our natural tendency to over-inflate first impressions. Whether it was Kapler, hitting coach Pedro Guerrero, or a front office suggestion, the Phillies have just about uniformly adopted a fly ball heavy approach in 2018. While the results have been roughly neutral so far, cold conditions and a bit of misfortune is likely the reason why. The weather will eventually heat up and the Phillies will eventually start playing more home games. When both of these things inevitably occur, expect the ball to fly out of Citizen Bank Park like its 2008. This article was originally published here at Off the Wall Baseball. For more from Traven and the team, follow them here. Bryce Harper: MLB’s Five Hundred Million Dollar Man?